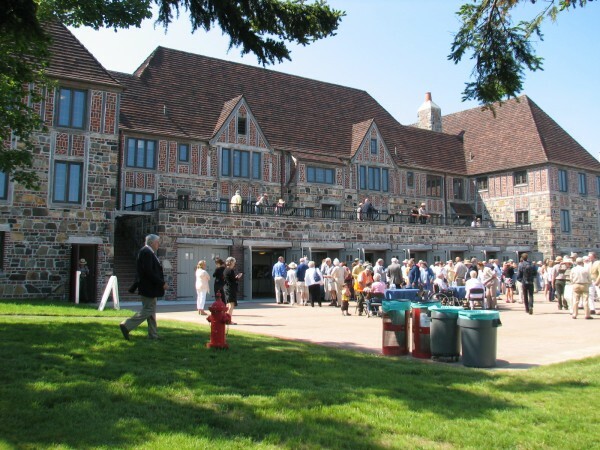 People mill about on the patio of Rockefeller Hall at the Schoodic Education and Research Center in Acadia National Park on Wednesday, July 3, 2013, after the renovated building was formally dedicated. The building, originally constructed in 1935 for the Navy, will serve as the welcome center for SERC. 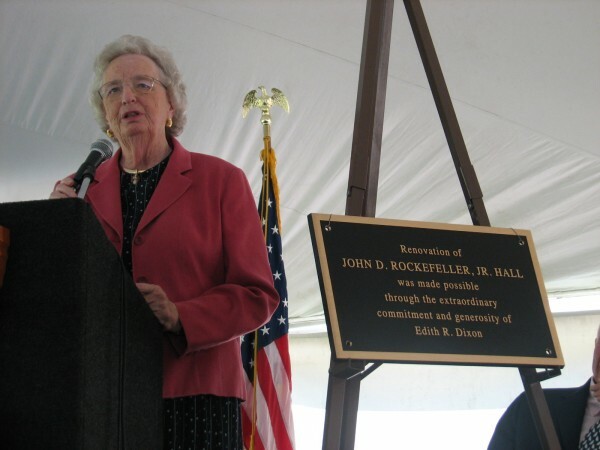 Philanthropist Edith R. Dixon speaks Wednesday, July 3, 2013, at a dedication ceremony for the renovated Rockefeller Hall building at Schoodic Education and Research Center in Acadia National Park. Dixon gave $1 million to help fund the $2.7 million project. ACADIA NATIONAL PARK, Maine — With fanfare and brass, National Park Service and other federal officials dedicated a newly renovated building that will function as the welcome center for the park’s education and research center at Schoodic Point. An estimated crowd of a few hundred people attended the event, which was held on the lawn in front of the building and featured live music by the Blue Hill Brass. Sen. Susan Collins and U.S. Rep. Mike Michaud spoke at the event, as did philanthropists Edith R. Dixon and David Rockefeller Jr., grandson of John D. Rockefeller Jr.
Rockefeller Hall originally was built by the National Park Service in the early 1930s in exchange for the Navy moving a radio listening post that it had constructed near Otter Cliffs on Mount Desert Island where the park and John D. Rockefeller Jr., one of Acadia’s major benefactors, wanted to build a road along the shore for visitors. For nearly 70 years, the Navy used the building and others at the Naval Security Group Activity Winter Harbor base for monitoring encrypted communications. Technology improvements prompted the Navy to shut the base down and hand it over to the National Park Service, which bordered the base on all sides, in 2002. Since then, Acadia officials have set about renovating the former military site into the Schoodic Education and Research Center, where it hosts educational and research programs related to its mission of conserving the natural environment. Some of the Navy’s former buildings were removed, as were some of the roadways on the 100-acre property, while others were renovated to support the center’s research and education mission. The Rockefeller building posed a special challenge. As with most military buildings, it did not have to meet civilian building codes and so was not handicapped-accessible and didn’t have standard fire safety measures. Inside its distinctive wood, stone and brick exterior — which resembles the park’s carriage houses on MDI — it had narrow hallways and small apartments well suited for serving the military but not ideal for welcoming the public. This led Dixon to become involved. The widow of Fitz Eugene Dixon Jr., former owner of the Philadelphia Sixers professional basketball team, Dixon pledged $1 million to help renovate the building, which was expected to cost $2 million. It ended up costing $2.7 million. “It turned out to be more expensive than I thought,” Dixon quipped at the dedication ceremony. At the event, Acadia officials unveiled a plaque crediting Dixon with making the renovation project possible. “I’m just glad my face wasn’t on it,” she said, eliciting laughter from the crowd. More seriously, she added that her husband, a Winter Harbor native, was devoted to his town and to the area. She said she supported the project because that is what her late husband would have done. The renovated 21,000-square-foot building has six residential suites for visiting scholars and artists and other VIPs, a reception desk, administrative offices, small-group meeting rooms, and exhibits. It also is now handicapped-accessible and has a sprinkler system, modern restrooms and an elevator. On Wednesday, it officially was listed on the National Register of Historic Places, according to Acadia officials. As Dixon did with her husband, Rockefeller made reference to his grandfather when he spoke about how the property has been renovated and how its function will help fulfill the mission of Acadia National Park.